Wedding candy buffets are a trend that has become more common in recent years. Your guests arrive at the wedding reception to discover a section of space dedicated to a multitude of sweet delights. They are displayed beautifully across a table in clear glass jars or vases with scoops for self-serving. And perfectly chosen containers are laid out next everything for the guests to stuff full of treats. This sugary set up is many things in one…Favor, entertainment and decoration! What do I need to create a candy buffet for my wedding? As usual, think about how many guests will be at your wedding, and start keeping your budget in mind when making your selections. 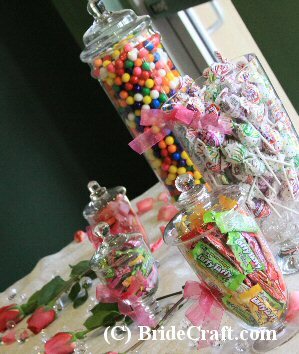 You will need glass jars or glass vases to hold the candy in. Try to keep all of the glass clear…this helps guests to determine what type of candy they are selecting. It also helps with the over all visual aesthetics of the wedding candy buffet. Also, keep in mind that the mouth of the container (the opening) needs to be wide enough that people can get the candy out with scoops, or pluck plastic or foil wrapped candy out easily with their hands. As a rule of thumb you will need small scoops, spoons or tongs for any candy that is not individually wrapped. You will also need favor bags or boxes for guests to tuck their sweet treats into. Keep the treat containers at a reasonable size! People will tend to fill a container up, so create a subtle portion control by choosing small to medium take-home containers. How much candy do I order? Ah, a tricky question that does not yet have a solid rule. Before you can decide how much candy you need, consider the containers you are putting them in, and the bags or boxes your guests will be filling. My personal rule of thumb would be to have enough candy to fill up one gift container/goody bag per guest attending, and then have extra. Most everyone gets silly over sweets, so you’ll want enough to provide every guest with at least a single gift containers worth of candy. And then you’ll want back up for the guests who just can’t resist another round down candy lane. And of course, you want the glass container itself to be full, or close to it, for presentation purposes. How can I make my candy buffet look really beautiful? First and foremost…color coordinate! Color has so much to do with how the final set up turns out. Carefully determine what is going to look good with your color scheme and purchase all of your candy and containers to suit. 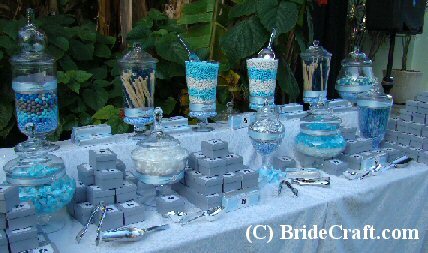 Your wedding candy buffet is one place where specialty linen would be appropriate, helping the whole look leaps and bounds. Consider staggering the heights of the candy jar displays. Having some containers a level higher than others helps give the buffet a fuller look, and can also help with congestion if your table is less than ideal. You can use everything from low plastic crates, cinder blocks, books and more to create different levels and heights. Covered by linen of course! Just keep in mind that nothing should be so high that it is out of reach. Remember to create a flow of traffic by having the majority of your favor containers on one side of the table, so that people will naturally “start” there and work their way down. If you feel as though your wedding candy buffet still needs a little something, consider other items to spruce up the table. Fluffy feather boas, rose petals, pictures in frames, bud vases, statuettes, etc, can all be used to help give your candy buffet an added kick.